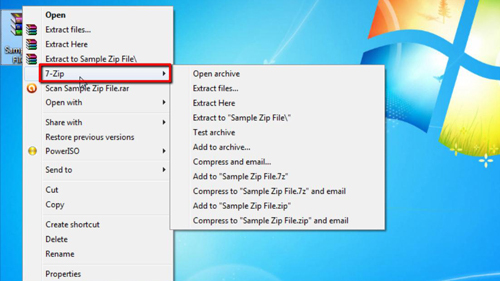 Zip files are great for reducing disk space, as well as transferring large groups of files via e-mail or another method of file transportation. A great way to make this process as simple as possibly is to use a program called 7-zip. Go to “www.7-zip.org” in your browser. 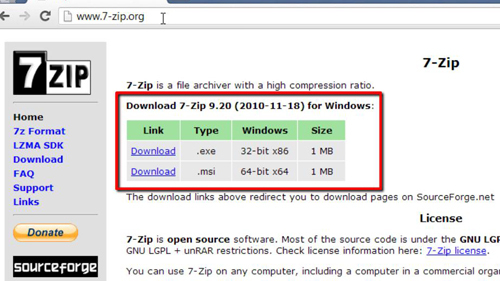 Right on the front page under “Download 7-Zip 9.20 for Windows” you’ll see two “Download” links. Click the first “Download” link if you’re running 32-bit Windows, or click the second “Download” link if you’re running 64-bit Windows. If you’re unsure which version you’re running, just click the first “Download” link. The download will start automatically, when completed, click on the file. An installation screen will appear, click “Install”. When the installation is finished, click “Finish”. That’s all there is to it, you’ve now successfully downloaded and installed the 7-zip program. To test it out you can see that we have a zip file on our desktop, all you need to do it right click on it, navigate to “7-zip” and click “Extract here”. The file will extract and the process is complete.